For all dumpster rentals, choosing a dumpster size is crucial to the budget of your project. Our experience can help. Give us a call\. We can discuss your project and recommend an appropriate sized dumpster for your dumpster rental. Here are specifications and guidelines for each dumpster rental size we provide. Single shingle roof debris up to 1,000 sq ft.
12 or 15 Yard Dumpsters Most Popular! 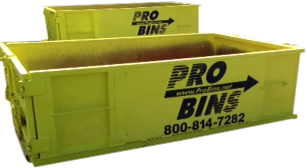 These dumpsters are generally best used with smaller sized renovation projects and multi room home cleanup projects. Single shingle roof debris from 1100 to 2,000 sq ft.
A 20 yard dumpster is going to have considerable higher walls than a 12/15 yarder. 20 yard dumpsters are generally larger home clean-out projects. If you have any questions about which size dumpster rental would be best for your home improvement project, give us a call and we will help you select the right dumpster size for your job.